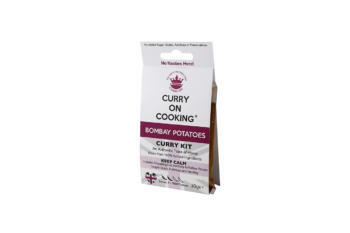 Also great with our Curry On range of main dishes; Madras, Jalfrezi, Balti,Tikka Masala or Korma. Me ha gustado mucho, combina con muchos platos. Lentejas, patatas, arroz, carne, etc. Muy recomendable si te gusta el picante. I used a quarter of a pack in a potato empanadilla (pasty) which I made last weekend – I should have used more tho, as the flavour dispersed thru the total mix a bit too much for me, and I quite like a nice kick – but the next time I’ll just make a whole batch up, as the flavour was incredible. Made Bombay potatoes for a curry night at a friends . Everyone agreed how tasty they where , most popular dish of the night. This is perhaps my favourite pack. I use them a lot. They make perfect bombay potatoes and I often do them as an accompaniment to an Indian roast chicken on a Sunday with a simple raita as well. I often only use half a pack and keep the rest. I usually mix my own spices, but I was ravenous tonight and didn’t have the time or patience. I had to eat the sweet potatoes tonight, but I wasn’t sure what to do with them. Looking for inspiration in my drawer of interesting ingredients, my hand fell on the packet of Bombay Potato spice I’d picked up at a food fair. I quickly pureed an onion, garlic, ginger and green chillies, fried them off with the spice, then added a squeeze of tomato puree. I chucked in the boiled sweet potatoes and a handful of frozen spinach and my new favourite quick meal was born. Delicious! Thanks very much!